Tonight it is back to fundamentals. Dr Jane Goodall has visited Adelaide this week and shared her story and her call to action for the world on behalf of her Jane Goodall Institute and Zoos SA. We also commemorate 50 years to the day since The Beatles arrived in Adelaide and performed a sold out concert. We talk with MC, Bob Francis, and delve into some lesser explored territory, and we chat with avid Beatles fan, Sandra Matz, who was not only there at the original concert but also at a commemorative concert held to mark a previous anniversary of the big event. Douglas Adams, late author of The Hitchhikers’ Guide To The Galaxy, gets a nod, given this is episode 42. That number is deified in the series as the answer to the ultimate question of life, the universe and everything. We have some warm follow up to our Janine Hardy story from episode 41, enjoy a blinded wine tasting and discover a softer side to local band, The Shambolics. We uncover the rudeness of a certain Australia’s Got Talent semi finalist while egging on a local participant in The Voice. Oh, and Adelaide newsreader and radio presenter, Jane Doyle, might be pleased to discover she has been dubbed an honorary Nigel for our podcasts, Nigel 6, thanks to her appearance in our Jane Goodall story. Jane would you like a separate dressing room next time you appear on our show? 00:01:24 Theme Theme and introduction. Our original theme song in full is here, Adelaidey-hoo. 00:05:10 South Australian Drink Of The Week Three Dark Horses 2012 McLaren Vale. Tasting notes. 00:07:47 Shout outs Steve sends one to Alex Frost Duo who had to deal with a rude semi finalist from Australia’s Got Talent who had his back to her and did not clap or stop talking through her sets. We need a show called Adelaide’s Got Ego.Brett: Kat Jade from The Voice. 00:13:57 Stories without notice Munno Para Primary School is planning to bring back free milk for students. It was scrapped by the Whitlam government in 1973. It began in 1950 to boost children’s behaviour at school, athletic prowess, absenteeism and dental health. 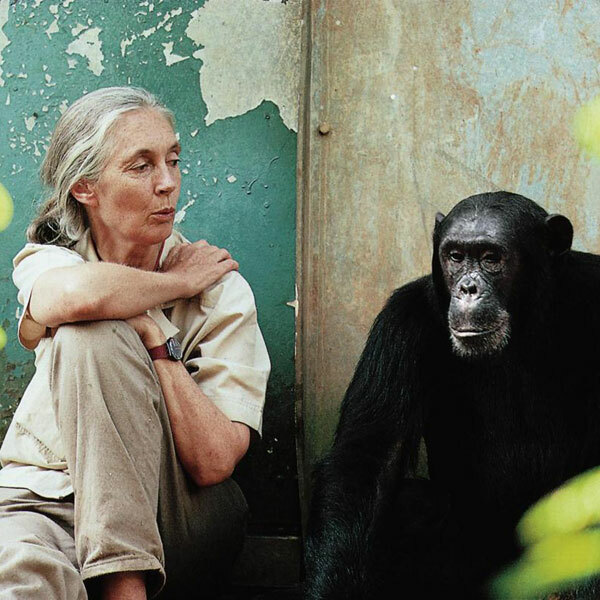 00:18:29 Interview: Dr Jane Goodall Jane Goodall is known worldwide as the woman who lived with the apes. In this episode we play some choice cuts from her talk at the Adelaide Zoo last weekend. 00:41:10 Adelaide’s Yesterdays This week, we commemorate 50 years since the Beatles came to Adelaide for a concert underwritten by John Martins. We chat with Sandra Matz, who was there, and Bob Francis who was the MC. 01:04:05 Stories from the street We received a contribution from Julie Shinnick about the Janine Hardy interview last week, using the audio recorder on our website. Steve also noted that Janine sent her thanks, saying: You’re a rare interviewer- you’ve done your research, asked great questions, relaxed the interviewee! That shouldn’t be a rare thing in a radio or tv host but it is! Every single person who has contacted me has commented on that fact. And that they learned a lot about my disease, about how the drug treats it etc, so I’m so thankful for the opportunity to be able to help people to understand. I’ve heard nothing but positive reactions, I think you’ve gained some new listeners, myself included, you do a wonderful job. 01:13:47 Brett’s Musical Pilgrimage The Shambolics with Only You.